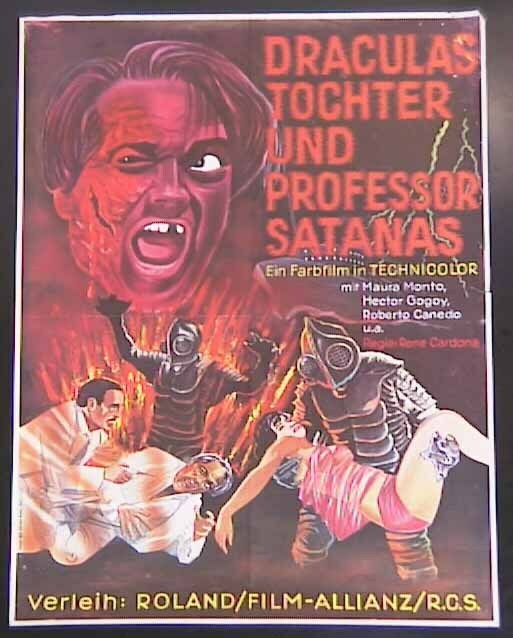 Here's a fascinating and practically seamless experiment in film genre, splicing Sixties Batmania to the Masked Mexican film. 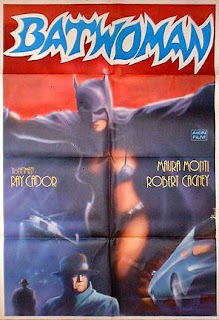 An infinitely more glamorous character than Santo, Batwoman stars Maura Monti, the tall gorgeous actress of Italian descent who featured in a phenomenal thirty five films in her four year film career before she disappeared. Usually playing in tandem with other actresses, or second-billed to wrestling superstars Santo and Blue Demon, her chance to strut her costumed stuff came in 1967 with the lead role in La Mujer Murcielago, or the Mexican Batwoman. The body of yet another drowned wrestler is discovered by fisherman off Acapulco, hot on the heels of a number of similar murders in Hong Kong and Macao. Autopsies reveal that in each case the juice of the wrestlers' pineal gland has been drained. 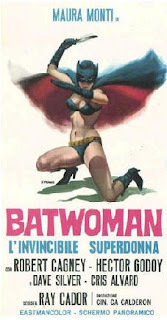 Police bring in secret agent Mario Robles to solve the mystery; he in turn calls in his own secret weapon Gloria, the beautiful, rich, crime-fighting female wrestler and caped crusader La Mujer Murcielago, or as we would call her in the English speaking world: Batwoman. Her anonymity allows numerous costume changes under her omnipresent Bat Mask, from wrestling sweats to braces, and the ever-popular Bat-Bikini, as she stalks her prey with bat-like stealth. Hot on her radar: famed Neurosurgeon (Clue Number One!) Dr Williams has just sailed his boat the Reptilicus (Number Two!) from Hong Kong and Macao (THREE!) 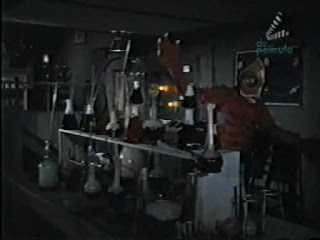 with his collection of fishtanks (...anyone still counting?). 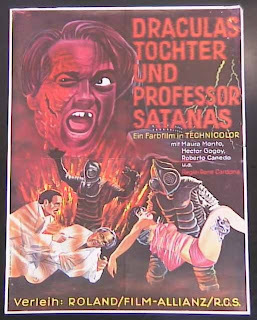 Competently directed by one of the Granddaddies of Mexican Pulp, Rene Cardona Sr avoids, to his credit, the usual Batmania cliches of Penguins, Riddlers, and cartoon henchmen in striped sweaters, and plays his goofy-looking Creature From The Black Lagoon riff relatively straight-faced. Cardona gets more than his pesos' worth out of the underwater footage, and let's not forget the masked wresting sequences. In any other costumed superhero film these would seem extraneous - here they are a positive boon, though Mara Monti's stocky wrestling double is so glaringly obvious, even the blind guy in the audience can tell she's packed on more than a few excess pounds between shots. 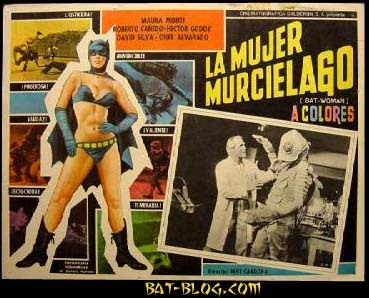 So here we have Batwoman going eye-to-fish-eye with a creature sporting the body of a goldfish, the super-grip of a GI Joe, and the pineal juice of a Swedish wrestler, in La Mujer Murcielago, or the Mexican Batwoman.